On my way out to look at the ’64 Falcon wagon I ended up buying, I passed a shop with these two cars parked out front. 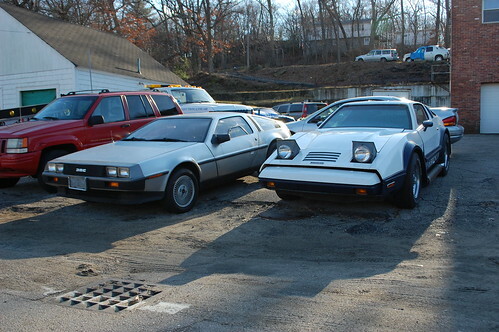 Seeing either a Delorean DMC-12 or a Bricklin SV-1 is an incredible rarity, seeing both at the same time beggars belief. However the pairing makes a surprising amount of sense. Both are two door sports cars, both have gullwing doors, both are made of unusual materials, both are nowhere near as fast as they look, and both were complete failures financially. 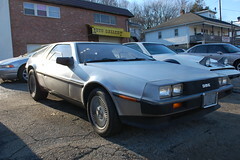 The Delorean is by far the better known of the pair, thanks to a certain series of movies. With it’s stainless steel body and gullwing doors, it at least looks the part of a supercar. However the rear-mounted Peugeot-Volvo V6’s performance was never able to match the body’s hype. The first prototype Delorean appeared in 1976, and was supposed to have an all-plastic chassis and Wankel rotary engine mounted amid-ship. However as the project evolved.and engineering challenges reared their ugly heads the design was changed multiple times. 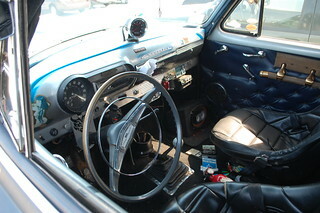 These delays, combined with issues with the brand new factory, strung the design process out so long that the first car didn’t roll off the assembly lines in Ireland until 1981. 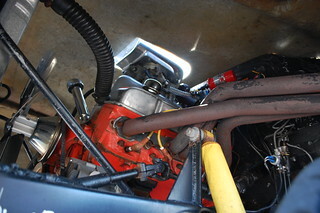 By that time the car had evolved in the a rear-engined V6 with a steel backbone chassis, and much of the performance & handling prowess had been lost to compromises and to meet various regulations. It launched into one of the worst car markets in decades and struggled from the beginning. The founder John Delorean being arrested on drug charges was the killing blow, and even though he was latter acquitteded the company never recovered. 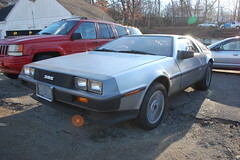 All total 9,200 Deloreans made it out of the factory before the company packed it in for good. 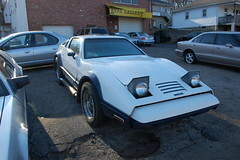 At only 2850 produced the Bricklin SV-1 is definitely the rarer bird here. This particular Bricklin has had some rather(to my mind) unfortunate custom touches added to it’s acrylic-fiberglass body. The widened wheel arches and side pipes do nothing for the “futuristic” wedge body shape, and the wire wheels look about as out of place as whitewalls on the shuttle. 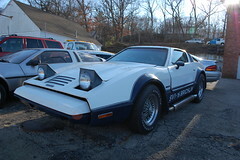 Conceived by Malcom Bricklin, the same man who later brought over the Yugo, the SV-1(or Safety Vehicle One) was supposed to be the safe, economical sports car of the future. 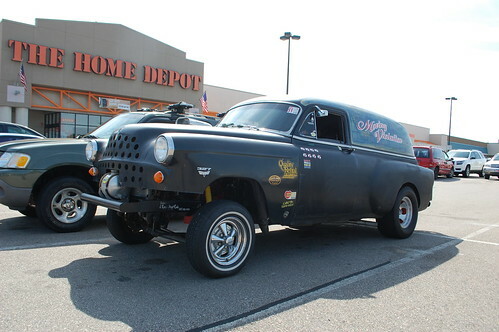 However all of the safety gear, and that crack-prone acrylic-fiberglass body added so much weight that the car ended up neither very sporty nor very economical (13mpg city/15-18highway). 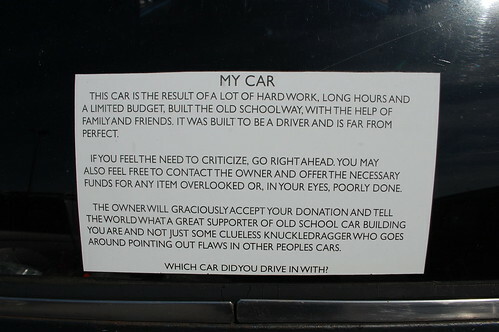 In addition to it’s lack of popularity, the company was being propped up by the New Brunswick Canada government(where the car was produced) and a financial scandal exposed that while the cars cost about $16,00 to build, they were being sold to dealers for $5,000. The company collapsed shortly thereafter and production ended. 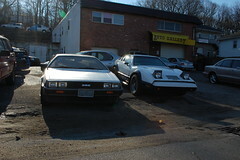 Unfortunately the shop these were parked at was closed, so I couldn’t talk to anyone there, but I’m guessing they are owned by a major weird-sports car fan(there was a second wrecked Delorean in the back). 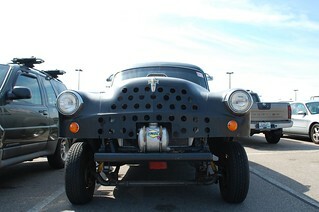 I have to say, seeing such rare cars was a heck of thrill, and really made my day. I love that instead of storing them away carefully the owner had them right out in front to amaze and confound anyone who happened to drive past.